A walk down Mulberry Street reveals several authentic Italian restaurants with prix fixe menus and drink specials this Valentine’s Day. While specials vary from place to place, you’ll enjoy a sugar rush no matter where you go as all of the restaurants along Mulberry Street offer a complimentary Valentine’s Day cannoli with your dinner. Buon appetito! Grotto Azzurra and Sofia’s are among the restaurants with ‘Amore Night’ deals. Grotta Azzurra’s prix fixe menu ($44.95 per person) features lobster ravioli and filet mignon alla gorgonzola as well as wine specials. 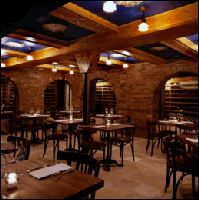 The cavernous restaurant has recently been renovated to embody one of the most famous caves in the world and Chef Frank Castellana recreates some of Italy’s classic specialties. Reservations are recommended and can be made online or by phone. The Chef’s Special at Sofia’s includes a four-course prix fixe menu featuring lamb chops, fettuccini and ciocolatto al tartufo e moscato – homemade cocoa-covered chocolate ganache truffles paired with a glass of sweet sparkling wine. Sofia’s is the place to venture out and try new wines. The staff will help you choose your perfect wine from the restaurant’s extensive selection. Reservations are recommended and you can either reserve online or by phone. Shopping is another highlight of Little Italy. The area is home to boutique clothing and accessory stores, along with food stores carrying imported goods from Italy. This Valentine’s Day, Accessories By Regali will take 20% off your purchase when you show them your dinner receipt from one of the restaurants in Little Italy. This entry was posted on Sunday, February 12th, 2012 at 12:01 pm	and is filed under Stuff to Do. You can follow any responses to this entry through the RSS 2.0 feed. You can leave a response, or trackback from your own site.